Photograph by Milos Bicanski/Getty Images. 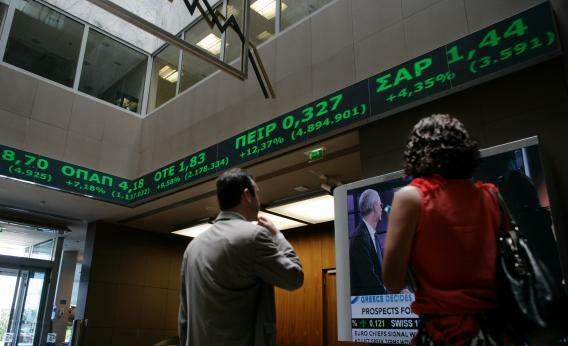 Sunday afternoon a fierce battle broke out between mainstream media copywriters assuring me that “the markets” would be pleased by New Democracy’s win in the Greek election and grumbling lefties in my inbox complaining that there’s more to life than reassuring the markets. Now as of Monday morning it turns out that the markets aren’t actually reassured and Spanish borrowing costs are now up over 7 percent again. One reason the markets aren’t reassured is that there’s nothing reassuring about an ideologically divided and inherently unstable coalition presiding over deeply unpopular austerity measures. Another reason markets aren’t reassured is that to the extent the “deeper issue” in Greece is endemic corruption and malgovernance driven by decades of New Democracy and Pasok running the state as a patronage mill for party supporters, forming a New Democracy/Pasok grand coalition is not a promising foundation for change. The insiders are circling the wagons and saying nice things to German officials in the hopes of keeping some money flowing in, but there’s absolutely no real solution here. Last but by no means least, Greece is basically irrelevant. This is a small, poorish country that has no broader significance in the economic world. If everything else was fine, you could solve—or not solve—the problems of Greece in a dozen different ways. The real issues are Spain and Italy, two much larger countries whose participation in the eurozone speaks to the core purpose of the European project. And while Greek-related worries don’t help Spain or Italy, the problems of Spain and Italy are also quite real and freestanding apart from anything happening in Greece. In Spain, the banking system is a total shambles and since the government can’t print money it can’t bankstop the banking system without bankrupting itself. In Italy, a large outstanding debt stock means that slow nominal gross domestic product growth risks bankrupting the government. In both cases the problems can’t really be solved domestically because the key levers are in the European Central Bank headquarters in Frankfurt, Germany, which has turned the whole thing into a complicated international negotiation. Don’t expect anyone to be reassured for more than a few hours until those issues get tackled. I wouldn’t hold my breath.